Are you building a wood rocking horse? Chances are, if you’re a woodworker, you’ll at some point make a rocking horse or hobby horse for some little family member. Here are some pointers for getting started on a project that may well become a family heirloom. Believe it or not, there are many different styles of rocking horses. You may have in mind the traditional rocker-style horse that stands on two rails, much like a rocking chair. You can also, however, build a rocking horse with spring suspension. Both will have their good points and limitations. For instance, the rocker rails may be less likely to pinch fingers, but the rails will take up a lot more room. The child also won’t get the bouncing motion that they would get from spring suspension. You’ll also have a mental picture of whether or not your horse will be stylized or realistic. Some people go all out and build a form, which they then have covered in cow hide or leather, with a genuine, tiny saddle. Most commonly, however, you’ll find the horse shape cut out of boards and pieced together. This is usually accomplished by cutting the body out of one plank, the head separately, and the legs and tail separately, held together with dowels. The size of your rocking horse is something to keep in mind. For little ones, a 16” tall saddle is plenty. Keep in mind that you can arrange the food rests so that they can be moved as the child grows. If you are carving the body of the horse, you may choose to either put a genuine saddle on its back, or to carve a seat as part of the body. 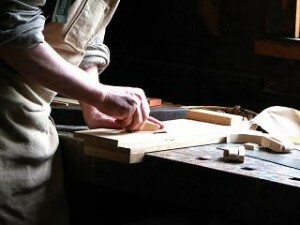 Often, the craftsman will build a seat similar to a chair. It will be attached to the back of the horse. Of course, the bridle is up to you. You may want to fashion real leather straps into a bridle of sorts, held in place with upholstery tacks. Others use the traditional “bolt through the head” handle. Rather than stirrups, you’ll see the foot rests, although stirrups are certainly acceptable. You’ll find patterns for rocking horses all over the internet. You’ll find them for all sizes of children, from toddlers to preschoolers. As a first idea, you could try this tiny pony from GoogleSketchup. You’ll want to router the edges, though, to reduce splintering and soften the look. No matter what pattern you pick, just study it carefully, and make sure you have all of the tools and supplies before you start, and your heirloom will be ready in no time. Wagner Meters is a world leader in moisture measurement products, with an expanded line of hand-held wood moisture meters that set the worldwide standard for accuracy and reliability to help you avoid problems with your important wood projects.